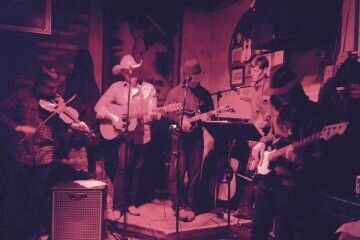 The Wind Drifters are a new(ish) band composed of experienced local musicians who have brought together their varied tastes in music to create a new sound for bluegrass, country, and rock fans alike. Their high-energy, powerhouse shows will get you on your feet. Combining everyone in the group’s amazing instrumental talent, The Wind Drifters bring exhilarating performances to the stage with upbeat, energetic music that will make almost anyone want to get up and dance. Come by the Hot Springs to hear this amazing group light up the stage.